At present optimum structural design is understood as a synthesis of several disciplines which individually are to a large extend developed : (i) design modeling, (ii) structural analysis, (iii) behavior sensitivity analysis, (iv) mathematical programming, and (v) interactive computer graphics. Their interactions reflect the typical loop of each design process (Fig. 1). The art of structural optimization is to join the interdisciplinary dependencies in a clear, integrated overall model and to convert it into an efficient and practical computer code . Today, all the leading software packages offer optimization modules, although of different quality and still mainly restricted to sizing. A lot of special software and procedures have been developed and presented in the literature which deal with shape optimal design [3–6]. The related process is reviewed and accompanied by a number of excellent papers [7–9], proceedings [10–12], and books [13–15] which clearly show the evolution from the first beginnings with sizing of structures to the latest developments in shape optimal design. Fields of applications are steadily increasing. Especially in automotive  and aircraft industries  the methods found wide-spread recognition as instruments of numerical simulation to improve structural quality. Civil engineering is yet behind to use structural optimization as a regular tool. But also here the methods can be used as an extra design aid; e.g. for the shape design of free formed shells [17–20]. 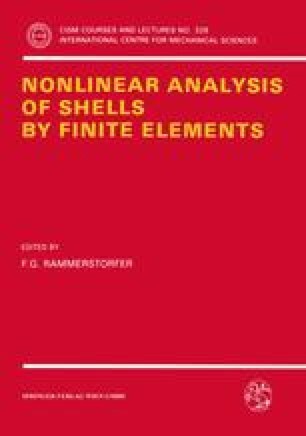 It is the intention of this contribution to give some insight into the basic ideas of the methods and the underlying modeling; the application to general shells is described in .